Although this recycled metallic gown was designed with a different queen from a different era in mind, we imagine it’s what an alternate-reality Marie Antoinette would wear in steampunk Versailles, give or take a century. Created by design graduate Emma Whiteside for the 2009 World of WearableArt show in her native New Zealand, “Queen Adelaide” is composed entirely of discarded automotive radiator copper, which Whiteside spent more than 200 hours sewing together. 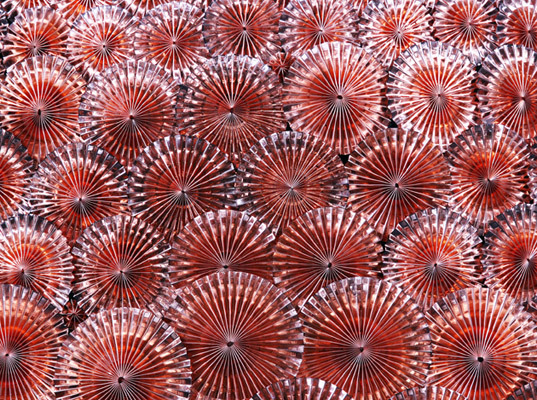 Whiteside spent over 200 hours sewing together rosettes of discarded automotive radiator copper. Her work on the gown, which weighs in at a staggering 22 pounds, more than paid off. 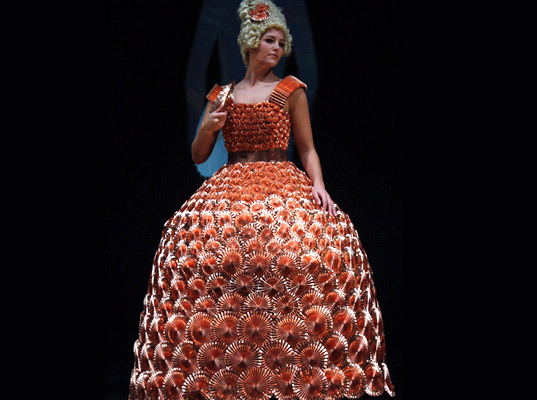 Whiteside won the World of WearableArts’ Shell Sustainability Prize, which came with a purse of nearly $4,000. Her model, however, wasn’t as thrilled. “One night she had to wear it for an hour and was quite sore,” she says.